On the 3rd April, 2017, Bernie posted that he has stage 4 lung cancer and about a year to live. On the 6th April, 2017, he gave his last keynote, the Brian Sutton-Smith Memorial Lecture for The Association for the Study of Play. In that talk he spoke about his history in advocating for play. On June 29th, Bernie went to the opening of two special intergenerational swings installed in his name as a memorial in his local community. On the 7th November, 2017, Bernie wrote his last blog post (for now). He said he wanted to spend time “with people, you know, and family, and friends and neighbors and weather and rocks and things”. 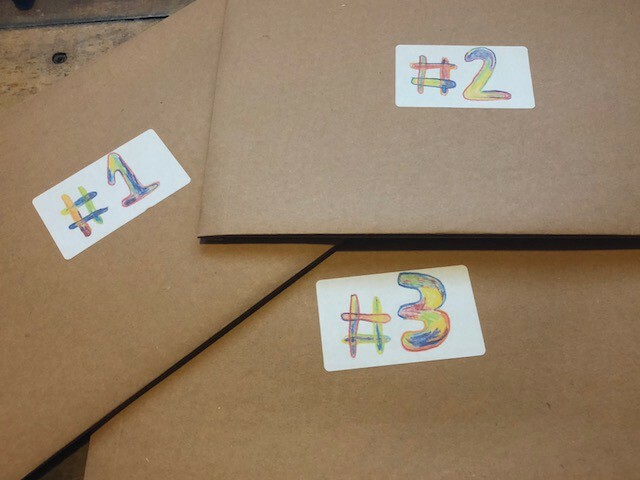 On the 30th January, 2018, Tassos Stevens posted about the first wave of boxes for Bernie’s “A Game of Legacy” that have just been sent to backers. I was one of those recipients. 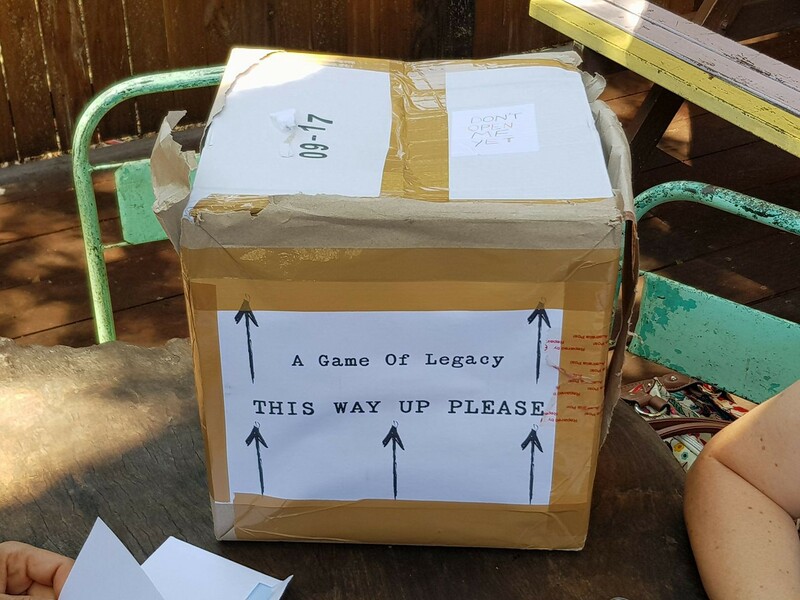 The box of “A Game of Legacy” posted to backers around the world in Jan & Feb 2018. Photo by Jacob Middleby. I struggle to find the right words to say to someone when they’re dying. No combination of words I think of does THE TRANSFORMATION EVENT justice. I couldn’t give my mother an obituary at her funeral because I was lost for words. I mean, I designed the funeral experience, the rituals around it, the images, the music, every little detail. But I couldn’t put together the script. I chose to have a song played for me, a beautifully crafted piece of music with haunting lyrics that was up the the standard of a speech I felt couldn’t give. I couldn’t post some words on Facebook to a colleague who was dying in a hospital bed on the other side of the planet. I spoke to him every night in my dreams, but couldn’t put the right words together while he was still alive. Nothing seemed good enough. A few years before, when another colleague was dying, a few of us from around the world sent folded origami cranes to his hospital bed. I can make, just can’t speak. When someone you love passes, when anyone passes over, it is to me a wake-up call. Their passing, the heavy loss of their presence, makes the world silent. And then I hear myself calling. Remember your mission here on Earth, Christy? Remember, remember, remember. I guess I don’t feel comfortable with obituaries because I see death more as a passing of the baton. I just don’t know how to be when death is around. Bernie has been getting cute with death. He has posted about the death-fun continuum with cats playing dead. 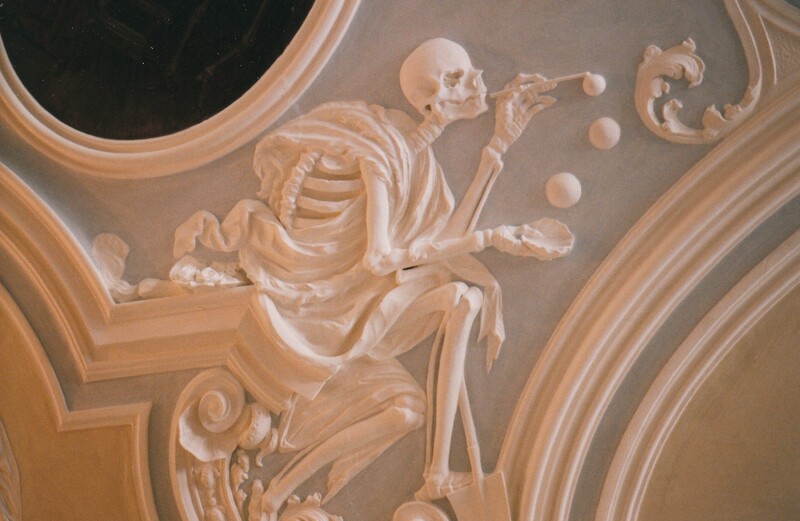 And he posted excitedly about discovering death “blowing floating marble bubbles!”. In the appendix to his book, The Well-Played Game, Bernie discusses “A Million Ways to Play Marbles, at Least”. In 2013, I had my advanced game design students move their seats to the front of the room. I pulled out Bernie’s book, and read out a passage. What Bernie talks about in this book is that the well-played game, the game that players end up feeling great about, is often one in which they veer off from those rules. And we’re not talking about hacking or breaking the game with malicious intent. It is in the spirit of shaping the game to what works to keep it going for all of us involved, so we don’t have to stop, so we don’t have to exclude anyone, so we don’t have to lose. It can become anything we as a collective agree upon, in that magical space. As Bernie said at his keynote last year, (and the book), when you’re playing well together you’re not collaborating, you’re coliberating. You’re freeing each other. Tassos Stevens and Bernie DeKoven coliberated A Game of Legacy. When Tassos heard Bernie had cancer, he wanted to do something. Tassos is the director of Coney, who make playful theatre, games and adventures. (disclosure: I brought Tassos to Australia for my 2011 event Transmedia Victoria.) On the 3rd July, Tassos launched a Kickstarter campaign to raise funds to make a game for and with Bernie in Indianapolis. 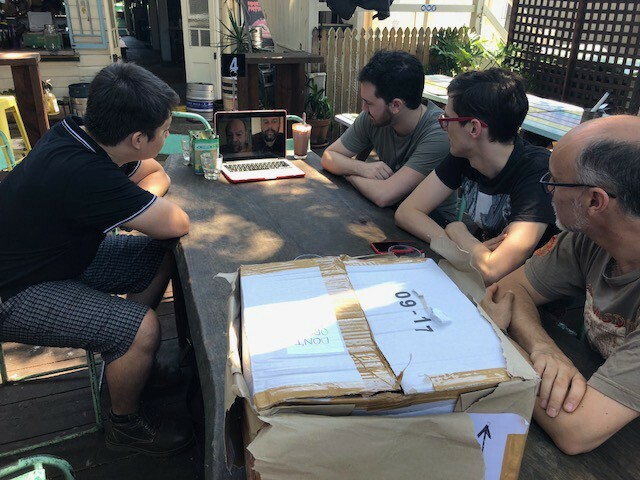 The travel was paid for by the British Council, the Kickstarter was the pay the artists involved in the making of the game, and Tassos’ time was paid by Coney. Tassos posted updates for us all, letting us know about the chats in the backyard, in the park. And then on Friday January 12th, 2018 it arrived. Well, it kind of did. I arrived home to find a big note stuck on the apartment wall saying, “If you’re Christy Dena, I have your package, ring me.” Intrigued, I called, and the neighbour had received a misaddressed package for me. I toddled off to find out what this package could be, and it turns out the neighbour is someone I see on the street all the time. We laughed and he handed over the big box. I knew immediately what it was. Deduction skills. I ran home and tore the wrapping. 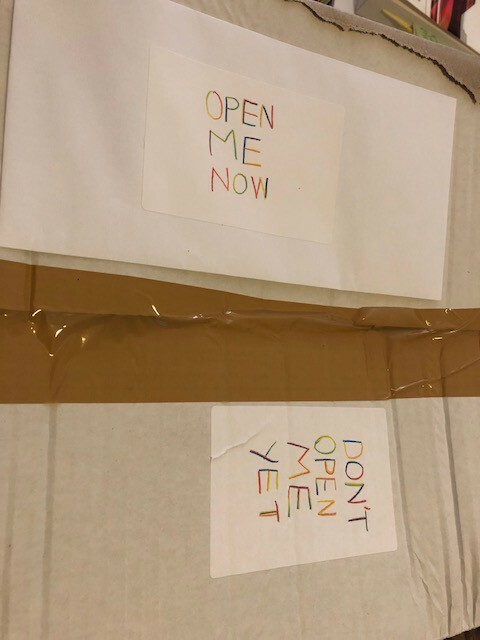 On the top of the box are two messages: “Open Me Now” and “Don’t Open Me Yet”. Photo of the top of “A Game of Legacy” box. I opened the letter, and in it I was encouraged to not open the box. Instead, I am to leave the opening of the box until I have the players assembled around a table. I love this. I think about who would want to play this, and then I decide to leave it up the players to self-select themselves. I post the invite to play to Facebook and a group emerges. We meet early on Saturday morning, 10th Feb, in a café. I had called ahead to the café to check if it was ok to play a game there. The lady on the other end to the line was excited. Of course, we’d love for you to play a game! We love games. So we had a table, I brought the matchbox the letter instructed me to bring, and Zac brought a laptop we needed as well. Soren Bok (left), Jacob Middleby (front right), Zac Fitz-Walter (middle right), and Ralf Muhlberger. We opened the webpage, and found Bernie and Tassos greeting us. We listen to Bernie and Tassos, and gently the site takes us back to the moments of conversation between them as they make the game. We hear them in the park, the chimes tinkle, we tickle the hummingbird to move, and we read they’re under an oak tree. I’m excited because at the café, we’re sitting under a big tree, with chimes, and there are magpies giving us the eye, checking out what is going on. I feel our worlds swirling together. 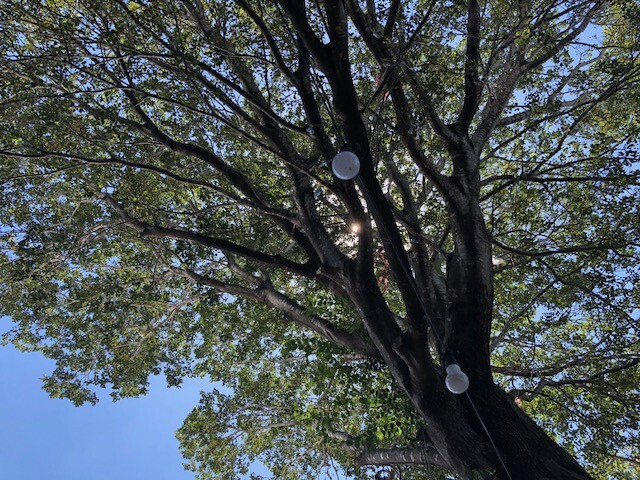 Photo of tree above us at the cafe, with chimes and birds. I love having Bernie and Tassos chatting away giving us stories and the prompts to the game. Of course it should be a highly personalised game. It reminds me of Ryan Green’s That Dragon, Cancer, and how we hear their son Joel throughout the game, along with hearing the family recordings, and seeing paintings by other cancer patient kids. In literary terms, “verisimilitude” is often invoked. Being similar, being like truth, or like real. But to talk about the realness of these games, and indeed of more and more projects across all artforms (like ARGs), doesn’t really explain it sufficiently anymore. The function of art is changing, the status of art of changing. Remember, fiction was an invention. It was conceived as being separate to reality. Now we’re moving in the direction of creating our reality. 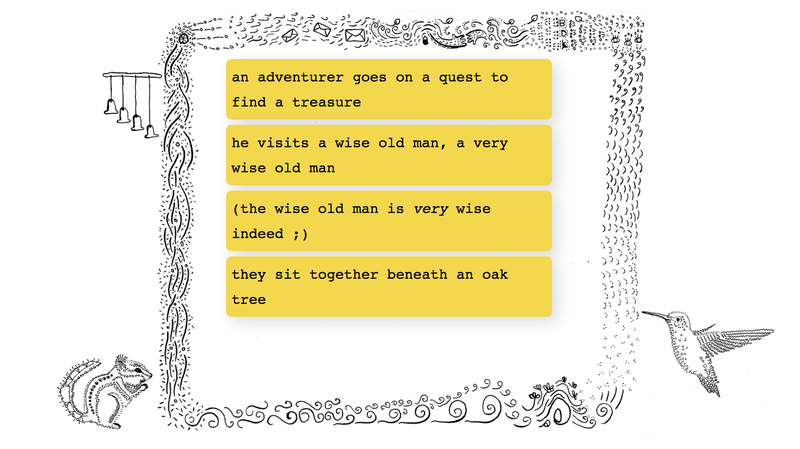 I think play and fiction are conceptual tools that allow us to think that more is possible. So rather than seeing them as distinct from reality, for me they’re becoming more our ways to imagine new realities. They are real, we just see them as fiction because they’re different from the realities others are busy creating. The next instruction on the screen is to open the box and lift out the envelopes and black boards and chalk. I don’t look further into the box, or show anyone, as it seems we’re doing a slow reveal. Lovely! We’re asked who wants to open up envelope #1, and they self-select. 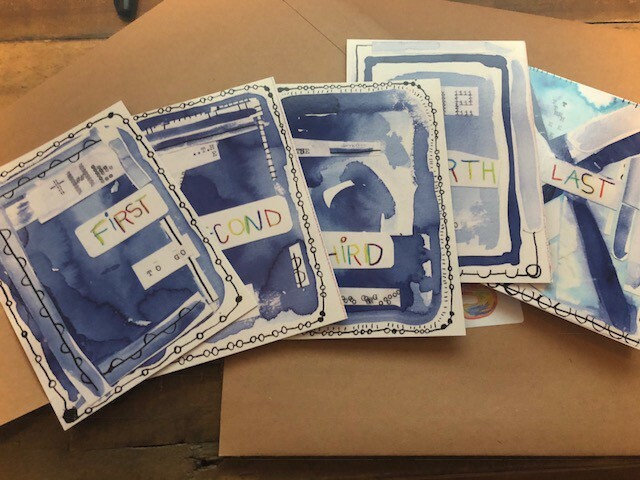 They open it up and find five postcards to be handed out to the players. We know from the numbers we’re to read them out in order. The sharing of the instruction task is a great way for us be on equal footing in the playspace. It is our space. The first task, the first play, the first Act, the first game. We’re told that: “These are not rigid rules but a starting point. For us to play a first game together.” We go off into groups and do our play thing, and then return to find out about each other and play. We’re all game designers, and so we know what is happening, but it is still a delight. I can’t help thinking, “we could have had more direction here”. And then slowly it dawns on me that it is truly for us to make the rules. We open the next envelope, and the rest of the box. We have a grand game to play…to make. We are to create the game. We do. We each start creating different areas and they begin to connect and mix. We’re building something specific, as instructed, but in any way we will. We’re choosing our way to play. We keep testing as we’re going, and I create a sign to help the marble along. Miraculously, the marble doesn’t miss once the sign is up. Yes, we’re making with marbles. 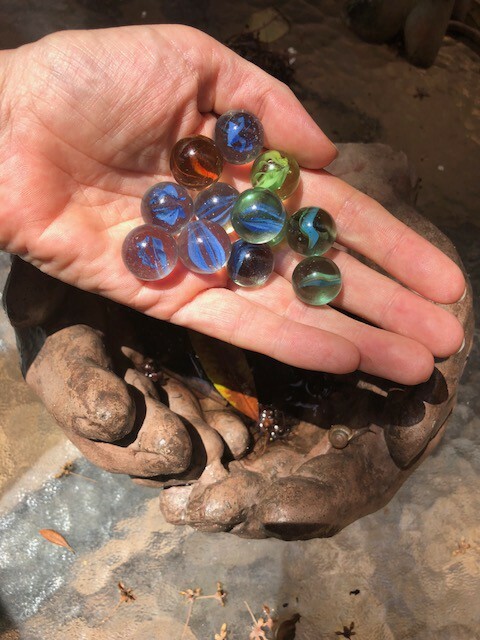 Marbles from my childhood playground. Death’s floating marbles. When my mum unexpectedly died, I revised what a meaningful existence is. At first I thought the most chief meaningful act a human could do is conceive and raise a child. I hung onto this for a while, but as I got older I let that go. It can’t be that only some people in the world can have a meaningful existence, and life is more than begetting life. Then I thought it must be to create a great work of art. To create an artistic legacy that affects generations. But what if I don’t achieve that? It seems, I discovered, I’m setting myself up for unhappiness. What about changing the world? That is a noble act, and is possible in some way. So I thought that every one of my artist expressions must be meaningful. Nothing frivolous or empty or shallow. And then my logic kept going until I realised that perhaps the most meaningful thing I can do is to live my own authentic, best, existence. I can affect others that way, but that is not the goal. It is to feel it myself. That is the greatest thing I can do. For me, right now at this point in my life, my creative life is about making a world I want to live in. That means I can create works of meaning without having a serious message. Because it’s very existence, and the world the players live in while they’re playing, is a transcendental act in itself. 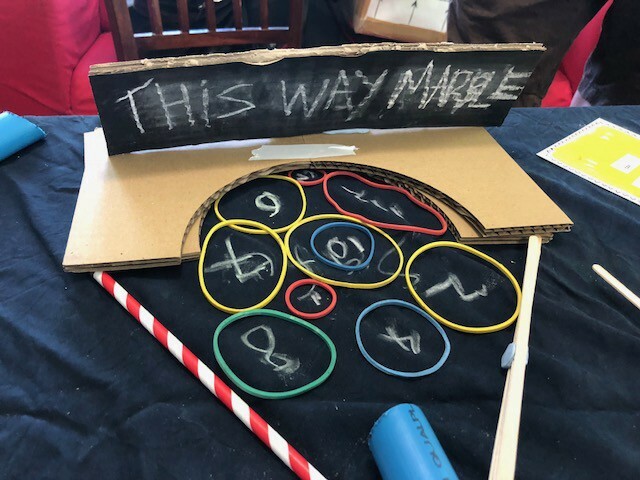 And now, thanks to Bernie’s marbles, I have a new part to my life equation: that of not needing what I envision for the creative work to be the work. I can bring into being creative works that are about me living in the world I create, and these creative works are also the worlds players create. There is room for many worlds. Thank you Bernie (and Tassos). I know why I couldn’t speak all those times when loved ones passed. Losing someone you love to death is the great reminder of what we’re here to do. Our true lover. Life. And what do you do when you get a wake-up call? When you’re surprised to your core? You gasp. You don’t have words. And what do you do when you’re playing “Pass the Baton”? You run, you keep breathing. Whatever it takes to pass that baton. Let life happen. To Bernie, there is a relationship between the well-played game and the well-lived life. I’ll leave the ending to him. How can you play A Game of Legacy? You can order the game by emailing game@alegacyofplay.net. You can find out who has the box near you and join in. You can sign-up to the “Pass it On” series that will start soon, inspired by the conversations and play between Bernie and Tassos. You can get the CD extra for the Kickstarter, Recess for the Soul. You get Bernie’s book, The Well-Played Game, A Playful Path. You can read Bernie’s blog posts, and game repository.